Our puppies mean the world to us and are raised in our home by our family where they receive lots of love and attention all day. They are handled extensively and socialized to a variety of sounds, textures, people and animals. As a trainer I understand the importance of early socialization and this starts with the breeder. We host two puppy parties one with kids and one with professional trainers by 8 weeks. 1. We feed a very high quality natural diet and supplements. 2. We show our dogs in working performance sports and confirmation and have them evaluated by various judges. 4. We socialize each puppy individually to different environments, people and animals. 5. Each puppy will have started crate training and have already spent time alone in his crate. 6. We start potty training puppies and they understand that going outside means going potty. No more waiting and walking around-the puppy will go immediately when it gets outside! 7. We evaluate puppies for resource guarding and teach them that exchanges are good. 8. The puppy will know how to sit and understand a "Puppies" cue means to come! 9. We offer 50% off all our dog training classes, privates and board and train packages. We have put so much hard work and time into our breeding program to ensure families get the very best companion. This all determines our price. We perform early neurological stimulation as studies have shown that the benefits include more tolerance to stress and greater resistance to disease. I expose my puppies to a variety of stimulation and enrichment from a young age and by the time they go to their new home they will be on their way to becoming well adjusted adolescents! We follow The Puppy Culture and you can click this link to learn more. We plan litters very carefully and with purpose. I usually am always keeping a pup to compete with and continue my vision of the line hence the name Aislin. First and foremost I value temperament. Aussies vary tremendously now and are either social butterflies or very reserved towards strangers. Being reserved is one thing, being aggressive towards strangers is another. The dogs we breed are very friendly and adore people. We encourage anyone interested in a puppy to meet our dogs and see for themselves how affectionate they are. All of our dogs are performance dogs and compete in a variety of venues such as obedience, rally, agility, herding and disc dog. We believe that it is extremely beneficial for dogs to be versatile!. Our 2nd goal is health. All of our dogs are tested for certain health problems associated with the breed. All of our breeding dogs will have their hips and elbows certified by the Orthopedic Foundation for Animals. We also have genetic tests done for the following eye problems: CEA, PRA and HSF4. We also have a CERF done prior to breeding as this needs to be done yearly. Aussies, like many collie breeds, may have certain drug sensitivities. Our dogs are all MDR1 tested and copies of all testing will be given to you in our puppy package. On this note, if you or anyone you know has a collie type breed please make sure they are aware of the sensitivities of the breed especially with ivermectin which is a wormer and immodium. Living on a farm with livestock that are wormed constantly we make sure all are dogs are tested. Dogs love to eat other animals stools and if they have the sensitivity it could be lethal. Even if they test Normal/Clear we have seen many cases where they still have a reaction to certain drugs. All puppies will stay with us until 8-9 weeks old. They will have no problem bonding with their new family at this age and the transition will be smooth as we have done most of the work. Your new puppy has already been trained to relieve himself outside using the clicker. The puppy will know sit and have a beginner recall as well. The puppy will know how to walk on a leash and puppy heeling will have been started. We will socialize the puppy extensively as the first 12 weeks of any puppies life is the most critical and we follow The Puppy Culture's method. We recommend that the puppy continue with puppy kindergarten classes so that you can learn the mechanical skills needed and to continue the socialization. We offer free puppy classes to all our puppy buyers. You will also be provided with the video collection of The Puppy Culture to help you those first couple months. We can keep the puppies longer for additional training if you desire. Please contact us to discuss further training. We will start a wait list a year prior to breeding so contact us if you are interested in a pup ahead of time so we can put you on the wait list-all this requires is filling out the puppy questionnaire. We don't choose the puppy for you, but will make recommendations based on your family, life style and goals. If we truly feel the puppy you choose is not the right match we reserve the right to not sell you the puppy. We would only intervene like this if we believed in our hearts this wasn't the right match. We truly care about our puppies and our line and want only the very best for them. As professional dog trainers we really understand about behavior and how to predict certain patterns. Our judgment is in the best interest of the puppy and your family as well! Puppy prices right are $3000-$3500 depending on the lines and particular cross. This includes the puppy classes and dog classes as well as the Puppy Culture DVD set. Please contact me about prices for specific litters and additional training if so desired. Puppy prices will be posted next to each individual puppy when the litters are born. All companion puppies will be sold on spay/neuter contracts. Puppies that are evaluated as show and/or breeding quality will have a separate contract. Please contact me if you are looking for a show/breeding puppy. Australian Shepherd Puppies are all registered with AKC, UKC, and some ASCA. 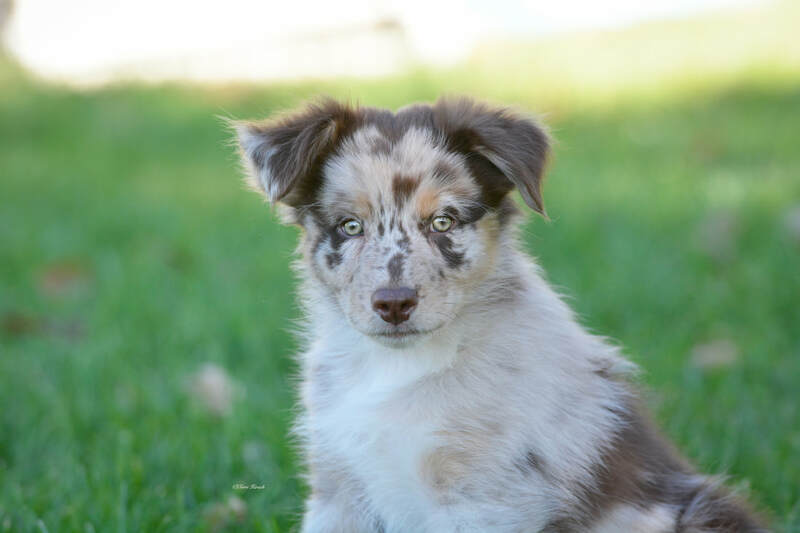 Our Miniature Australian Shepherd puppies can be registered with MASCA, IMASC, and ASDR and some AKC. All puppies will have been with wormed with pyrantel starting at 2, 4, 6 weeks and then panacur at 8,weeks and vaccinated with distemper/parvo at 9-10 weeks according to Dr. Jean Dodds recommended vaccination protocol and also the Nomograph we do to determine when the maternal anitbodies run out. A follow up distemper/parvo (core) should be done at 14-16 weeks old or when the nomograph determines the titer is low. Then at 20 weeks old-rabies. We then recommend a booster given 1 year following vaccination and then titers performed every 3 years to determine when to vaccinate again.